This flashback is another sequence that was not in the original script. But I realized that, not only would there be a lot of questions about how the Wow Mart survivors sustained that initial attack, but I also realized it would be a lot more fun to see it than to have two characters talking about it. I’ve always wondered why large, unkempt women wear wolf shirts so often. I don’t know if this is universal, but you definitely see a lot of enormous t-shirts featuring majestic imagery of wolves. I wonder if morbidly obese women love wolves, or if at that size you only really have the choice between polka dots, Tazmanian Devil if you are a dude and a majestic wolf if you are a woman. God help me, I hope I never get to be that big because, though I love Looney Tunes, you’ll never catch me in a XXXL sleeveless Taz shirt. I have my boundaries. Thanks to everyone who ordered books and commissions. I just got the shipment of books in, so I will be working on all those orders this week. Thanks for reading, and especially thanks to everyone who supports this comic on Patreon. If enough people supported it I could probably get it done faster. That would be pretty awesome. 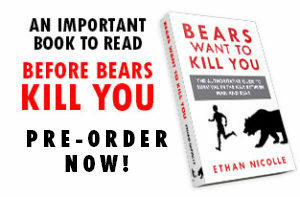 If you would like that, help me out and share the comic with your friends and the Patreon page with people you know who like supporting comics about bears killing everyone. PWOF!!! They joyous delight of silly, magnificent, funny onomotopeia (I never know if I am spelling that correctly) has returned!!! I shall be adding PWOF to my personal lexicon. I like that Ken named that one bear Diaper Face. 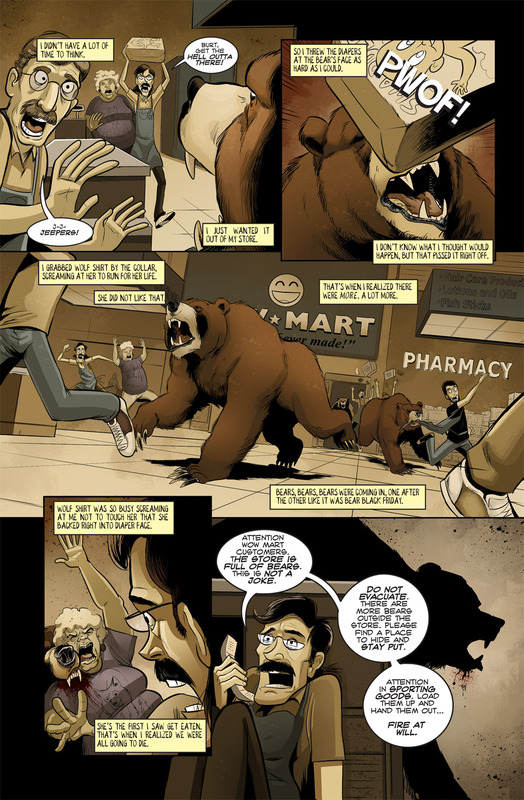 “The store is full of bears” is the best line of the comic so far. You forgot the Tweety Bird shirts that have some kind of “Tweety got ‘tude” phrase on them. Or is that a relic of the 90’s now? There’s always a Wolf Shirt. Until she gets eaten. Later we find out that Wolf shirt ate the bear instead. “The store is full of bears!” That really is fantastic. Good eyes. Good eyes. I’m glad somebody caught my fish stick easter egg. Huh, Ken’s a pretty cool dude.